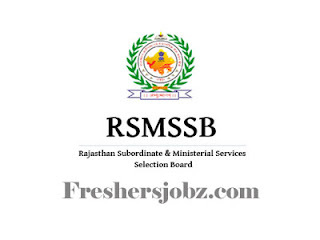 RSMSSB Notification 2019.Rajasthan Subordinate and Ministerial Service Selection Board (RSMSSB) has released a notification for the recruitment of Junior Scientific Assistants vacancies.Check the eligiblity and notification prior to apply for the positions. B.Sc degree holders in relevant discipline from a recognized university can apply. Minimum age to apply is 18 years, maximum age to apply is 40 years as on 01st January 2019. In the pay matrix 10 candidates who are going to work as junior scientific assistant post. Through written examination candidates will be hired up. Mode of applying for RSMSSB Recruitment 2019 is through online mode. Up to 19th February 2019 candidates can apply online. http://rsmssb.rajasthan.gov.in/ is the link to apply online.